Today, I have partnered with Theos Medical Systems to start a conversation about bedwetting, and the solutions the Chummie Bedwetting System offers! All opinions are my own... and my friend's, who's son tested the Chummie Elite for me! Had I known potty-training was going to be such a nightmare, I would have held off until Ollie was showing actual signs of wanting to go to the potty on his own. You know, like saying, "Hey! Mommy, I need to pee," then run off to the potty. But, nooooooo. I had to start potty training my kid right after he turned a year-old because my MIL not only insisted FTD was potty trained by one, she send Ollie a complete Australian potty-training gift set for his birthday. So, even though Ollie could walk, but not talk or climb on the potty without assistance, I gave potty-training my best effort. Today, my friends, I have the pleasure of sharing a product that wakes your pee-pants child up the second the first drop escapes his body! All it takes is one drop of urine to trigger Chummie alarms. 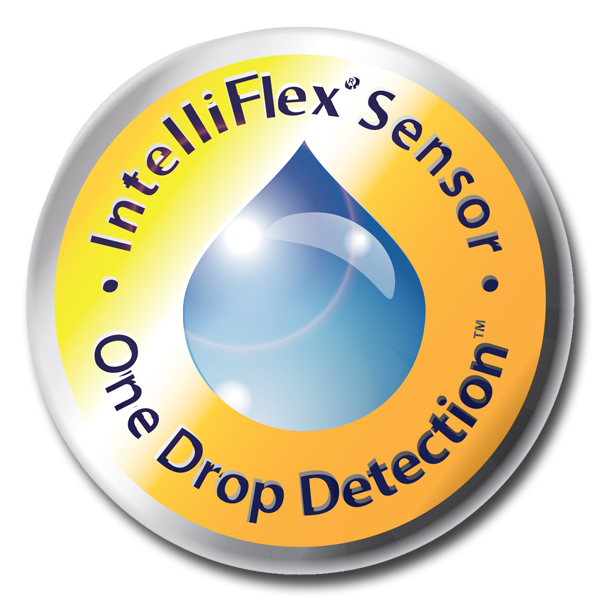 Its smart IntelliFlex sensor (comes with Chummie Premium and Elite) and IntelliFlex Mat (comes with Chummie Pro) are powered with the pioneering One Drop Detection technology , which means they detect and respond to the first drop of urine. The smart technology allows Chummie to detect urine quickly and trains your child fast. What’s more, your sensor or mat will not lose sensitivity even after years of constant use! So, how exactly does the Chummie work? 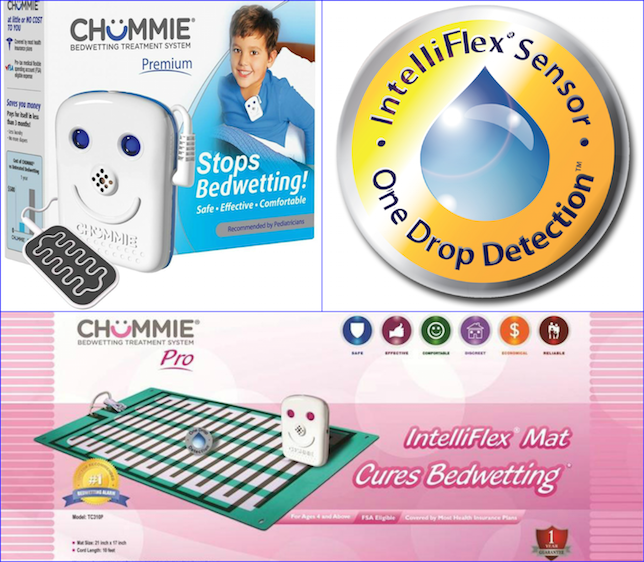 Chummie Premium, Elite and Pro attach to your child, or the Chummie Intelliflex Mat, which is used under the sheets. Since Chummie Elite is recommended for parents with children 4-years and older, I sent the unit to a girlfriend with a four year old to try out. While, like me, she was unsure of the whole attach the unit to child part, but she was desperate for a solution, so she gave it a go! The first night, she had trouble getting her son to stop playing with the chummie, so her first recommendation is to let your child play with it well before bedtime. Her next recommendation was to not only tape the chummy to your child's underwear, but mid-way up the shirt as well, or deal with a child "constantly messing with it." Of course, she said the first two nights, her son didn't wet the bed. But the third night, Chummie woke her and her son up. I was surprised to hear her tell me that ended up being a good thing! Of course, her son had fully wet the bed by the time he roused from his sleep, but in waking her up, she was able to deal with the situation (Changing her child and the sheets) immediately. It turns out, this keeps you from having the pee soak into everything and a child wet climbing into your bed. After two weeks with the Chummie, she said the peeing didn't completely stop, and it wasn't every night, but her son was waking up more quickly when the alarm went off, and was even able to run to the bathroom to finish the job! While she still has some bedwetting issues, she says you can definitely see how the Chummie is working, and she's going to continue using it! She also mentioned the age limit is correct; "children under four would play with the wire and unit non-stop!" So for younger kids, The Intelliflex Mat would be ideal. (I LOVE THIS!) 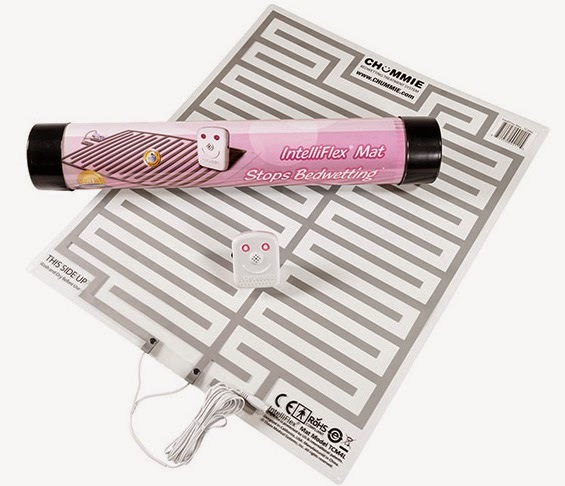 All you do is place the mat under the fitted sheet and connect it to Chummie Pro bedside alarm, with a 10 foot long cord! Chummie Pro is a great choice for anyone (including special needs individuals) looking for an alternative to wearable wired alarms. 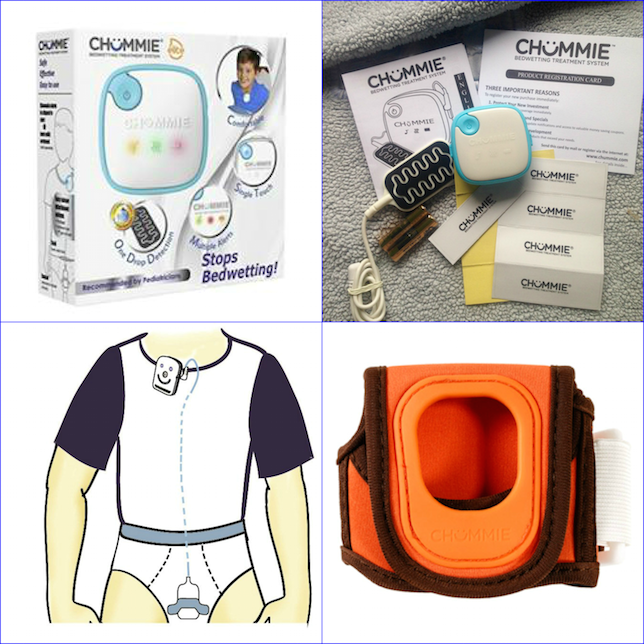 If you need to banish bedwetting, the Chummie is certainly a great option! To order now, (To get free shipping, Use 'FTMD Free Ship' at checkout!) or learn more about the many bedwetting products and accessories available from Theos Medical, Click here!